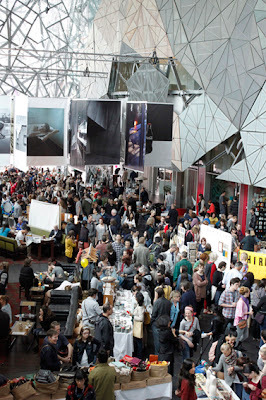 If you are in Melbourne and seeking something fun to do today why not head into the Atrium & BMW Edge Theatre, Federation Square and visit Markit. There is a fantastic line up of designers and always an electric atmosphere with the buzz of people. 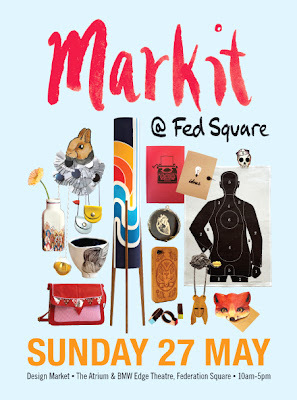 Hot Toffee will be there with my brother Shannon holding the forte today. He has been my helper at Markit in the past and is kindly running the show for me today. He will be selling my gift cards, hairpins, cuff links, lapel pins, studs in every colour, drops, wind chime earrings, bird garlands and our pretty colour clusters on chains or hand plaited cord. Our stall is still in the Atrium but in a different spot to where we've been in the past. We are between Porcelain Bear and Pleatybunny by Miss FOO a few stands up from LoveHate. For those of you who can't make it to Markit but do feel like a spot of shopping simply enter 'helloMarkit' at checkout to receive 20%* off the total of your order (excluding shipping). *This offer is only valid on items in the hot toffee etsy store Sunday May 27 from 10am - 5pm.